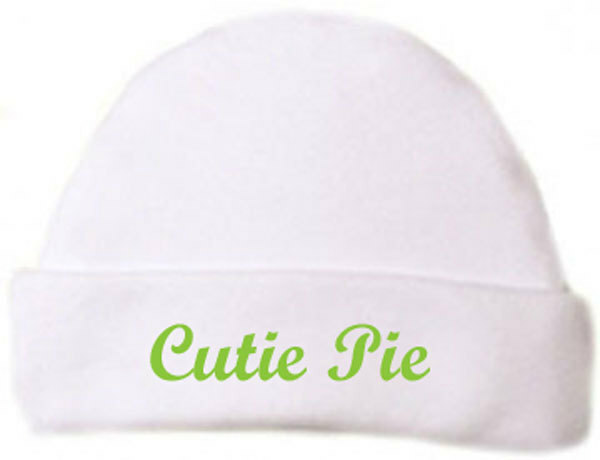 Let everyone know your preemie or newborn is a little "Cutie Pie" with this baby ultra soft combed ringspun cotton cap made of 100% cotton 1x1 baby rib. Great for introducing your newborn to grandparents, family and friends. Five NICU premature infant and newborn baby sizes! Tiny preemie fits under 1.5 pounds, micro preemie for babies weighing 1-3 pounds, small preemies fits 3-5 pounds, preemie fits 4-7 pounds and newborn fits 8-13 pounds. Attic Angels Clothing Made in the USA. ?Email your choice of thread.